Starting from a caucus of the Evangelicals for Social Action in 1973, the Evangelical and Ecumenical Women’s Caucus (EEWC) is a non-profit international organization formally founded in 1975, which has been working to educate and support Christian feminists. The organization contains both women and men who believe that the Bible supports full equality of the sexes. In different chapters throughout the United States, the feminist members promote the use of women’s abilities in all forms of Christian careers and promote interaction and help within the Christian community. The educational opportunities with EEWC enable Christian feminists to grow in their faith and also in the critical issues which face Christian feminists. Throughout its history the organization has changed its name a number of times to reflect its development. Originally they began as the Evangelical Women’s Caucus (EWC), which then changed to Evangelical Women’s Caucus International (EWCI). 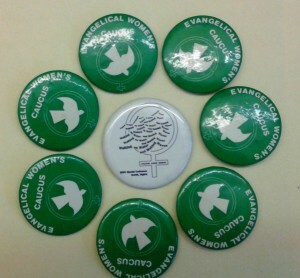 It was in 1990 that they selected and changed their name to Evangelical and Ecumenical Women’s Caucus (EEWC) in order to reflect their inclusive nature. 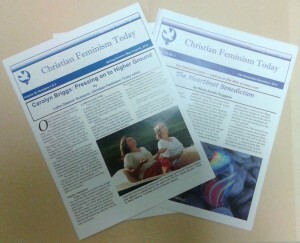 However from 2009, after the donation of their papers to the Burke Library Archives, the organization now combines its name with the online name Christian Feminism Today as Evangelical and Ecumenical Women’s Caucus – Christian Feminism Today (EEWC-CFT). From 1977 to 2012 EEWC distributed newsletters to their members and other contacts. Articles for the newsletters were written by members of the organization or those who sent their articles to the editors. In the editorial records correspondence can be seen between the women writers and the editor-in-chief. Throughout the different series interesting information resources are to be found, which were either referenced in articles or used as background topical information for discussions. The contents of this collection reveal the interesting story of a small caucus of feminists in 1974 emerging at the conference of Evangelicals for Social Action. Over the years this developed into an international organization. From the start EWC (later EEWC) supported the development of local Chapters, so that women could meet and develop organizations in different states and smaller localities. The collection contains papers from a number of these local chapters, some short lived, others still flourishing. In 1978 the EWC became self-sufficient by its incorporation and moved from being a network of chapters into an incorporated nonprofit organization. The biennial Conferences are a significant part of EEWC’s success and a specific sum is set aside for the next conference as part of every annual budget plan. The fact that this organization’s conferences are held in different locations may enable members’ attendance from a range of US states. Previous conferences have been held in Pasadena, Saratoga Springs, Chicago, Wellesley MA, Fresno, Norfolk VA, Indianapolis and Claremont CA. Naturally posters, fliers, and promotional items such as tote bags, pins, pens and pencils are produced for members attending! Thanks to support from EEWC-CFT all 39 linear feet of the organization’s archival records are now processed and the finding aid can be consulted online. The Burke Library welcomes researchers who wish to consult this archival collection and you can request an appointment through this online form. This entry was posted in Collections on July 2, 2015 by Ruth Tonkiss Cameron.